The Cognitive Aviation Training ENAC.CA.APR.053 is a training centre authorised by ENAC – (Italian Aeronautic Authority) to issue professional drone pilot’s licences. The centre operates in its premises in Catania – Ragusa – Marina di Modica to issue the Certificate for Student Pilots APR (drone=APR Remotely Piloted Aeromobile). The training proposed by our Training Centre is aimed at professionals or enthusiasts who intend to use drone aeroplanes professionally, for which we are also authorised to provide appropriate consultation. Our objective is to train a pilot-operative capable of using a drone safely-effectively-efficiently. The training we propose allows you not only to pilot and operate the machine respecting the Safety laws and rules, but also allows the drone pilot to learn to manage it with an organized approach, for a long-lasting and efficient use of it. Our method allows the Operator to have a constant monitoring of the operations and a reduction of the costs linked to the running of the machine. To reach its aims of proposed high quality training, CA APR Cognitive Aviation Training uses advanced resources, technology and methodologies. Indeed our courses use e-learning training, to allow the students to study comfortably from home, as they do part of the course online, flight simulators dedicated to drone piloting, interactive teaching tools – CITT – which allow you to live the training experience in 4D thanks to Virtual Reality systems. Finally, the training methodology used: Our method is Competency based and is based on the aeronautical rules with reference to aeroplane pilots. 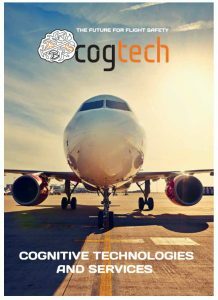 Cogtech training aims to prepare the aeronautical leaders of the future, competent, safe, reliable and economically profitable.